DOYIT Project accomplishes its aims! The Developing Online Youth Information Trainings (DOYIT) project has reached its completion, which was marked by the final consortium meeting and a launch event in this year’s European Youth Capital, Cascais, Portugal. The consortium meeting reviewed the project’s achievements and planned the future exploitation of the new eLearning platform. The next day, during the launch event, the consortium members presented the project’s outcomes to interested youth professionals and discussed the role and potential of eLearning in youth information work. 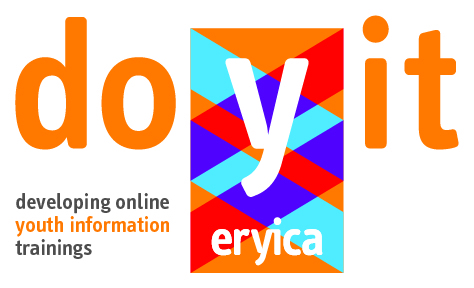 The DOYIT project has adapted ERYICA’s Digital YIntro, YoMIM, JIMMY and ALTYO training courses to an eLearning platform, in order to increase the outreach of our training system and upgrade the training opportunities provided for youth information workers. 8 ERYICA Members and a higher education institution cooperated with us during the last two years to reach these aims, and we thank them for their support and investment in this development process. Dear Members, up to you to exploit these opportunities now!